Olympia Time: Why does Olympia have a low immunization rate? A couple of years back I was shocked (shocked!) at the high rate of immunization exemptions in Thurston County and especially the Olympia School District. Back then the state had just passed a law where parent's have to more expressly say why they're exempting from immunization. 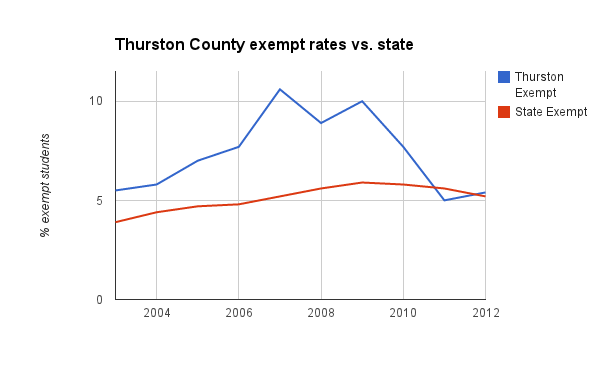 Apparently that extra social hurdle has worked in Thurston County. While the countywide trend has gotten back to the statewide average, it looks like Olympia still stands out like a sore thumb in the county. All of my data came from here. Cascadia is known for its high rates of people who don't like giving their kids shots (for whatever reason), but there's been very little explanation of why. Some people pointed to that in Washington it had been easy to get out of immunization. But, that has changed, and the rates are still pretty high. What if there is a broader social culprit? I'd say its possibly a cause of how people on the ends of either the left or right liberal slant (traditional political spectrum) don't necessarily feel the social pressure to conform to something getting immunized. 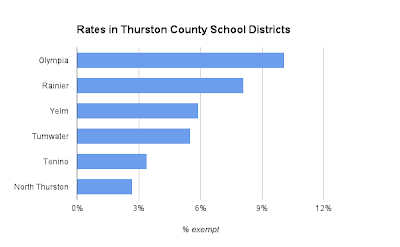 The Inlander piece I linked to earlier points out that homeschoolers and religious schools have some of the highest rates of exemptions in 2011. Possibly our social culture of living and let living allows for people to shut themselves off from guarding the public health.